100+ Women is a group of 100+ local women who are passionate about making an immediate, direct, and positive impact on worthy charities within our community. Join us and 100% of your donations go directly to the quarter’s chosen charity. How to become one of the 100+ members? Simply show up to one of our quarterly meetings and sign up (annual commitment). 1. Show up. Complimentary appetizers and cash bar! 2. Bring a blank check for $100, unless signed up for our convenient online auto-pay system. 3. Listen. Members have the option to nominate a local charity, non-profit or worthy cause located in Mt Pleasant, Burlington, Ft Madison, or Fairfield, Iowa. We draw the names of three nominations at random at each meeting. The member who nominated the cause then makes a 3-5-minute presentation to the group. The member can be someone who is directly affiliated with the cause or simply passionate about it. 4. Vote. Once all of the presentations have been made members vote on which cause to support. 5. Feel good. You just did something powerful and amazing for your local community. The Charity with the most votes receives every $100 donation! 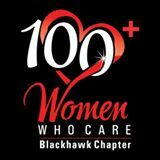 On each of these nights during the year, 100+ Women Who Care: Blackhawk Chapter gives $10,000+ to a local charity or non-profit organization right here in Southeast Iowa. It’s fast, simple and amazingly effective.